While I don’t yet have a stunning after shot of the backyard, we are making some progress! We painted the back of the Storefront. This was a bigger task than you’d think, after scraping, caulking, priming, and two coats of paint, only painting in mornings so there would be no direct sun on the paint, it took a whole long while! Glad to have this one done. 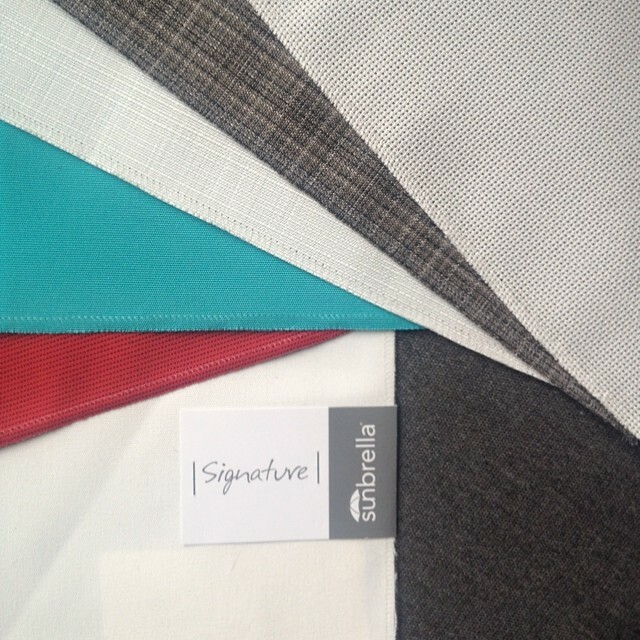 We almost choose a door paint color, but then decided to get sample fabrics, and decide on all the colors at once. We will be making new outdoor drapes (this time out of real outdoor fabric instead of drop cloths.) We will also be making a nice permanent cover for our outdoor daybed, again using the super durable and water repellent fabrics from Sunbrella. We borrowed Grant’s Mum’s car, and loaded it up with HPB (High Performance Bedding), a cool rock product that is the perfect bedding for pavers, and requires no sand or compacting. 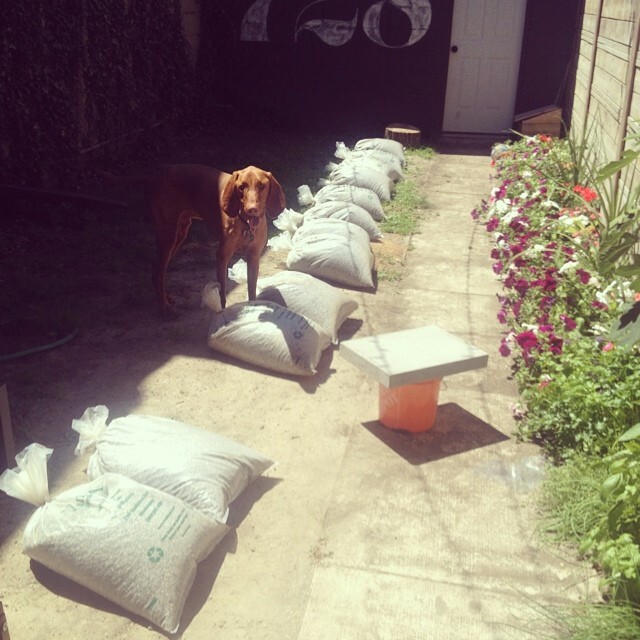 We purchased 12 cubic foot bags of it from the super nice & helpful guys at Van Beek’s Garden Supplies and lugged it home and into the yard. 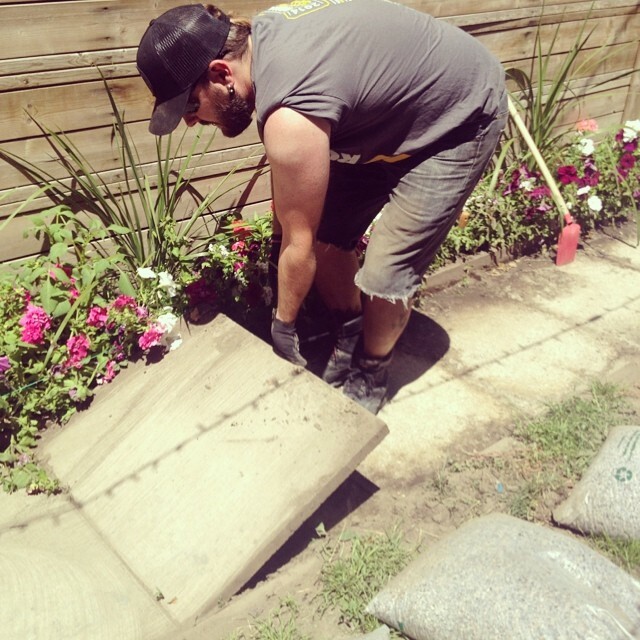 We then pulled up the old 30″ x 24″ pavers (man they we’re heavy! 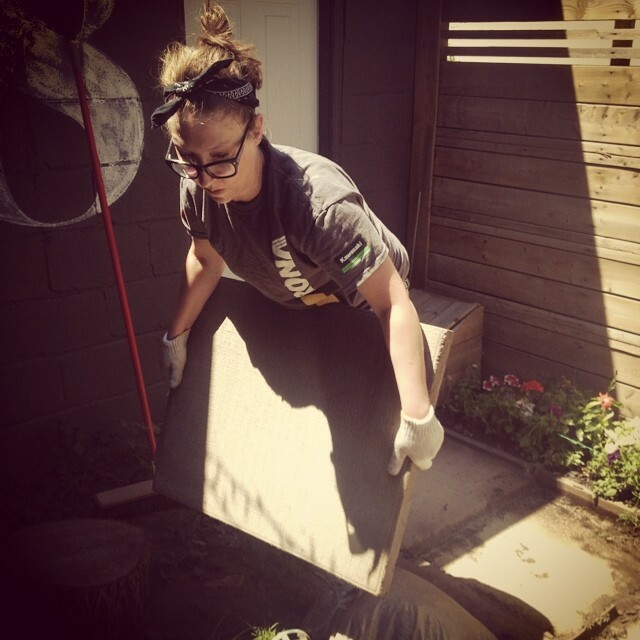 ), laid down the rock, screeded, and laid the pavers back down. We really wish we had the budget for new pavers, but the most important part of this job was to fix the drainage problems. We did have one ace in our sleeve however. We flipped over the paving stones, so instead of having a fugly textured concrete pattern, they are now just plain concrete. A lot more industrial looking, and surprisingly a big transformation. I’m not going to spoil the after yet, so you will have to wait a bit longer to see what they look like. The most important thing however is we had a huge rain storm last night, and there was ZERO lake in the backyard! No dirt on the path, and no puddles! Big win for the Storefront. As much progress as we’ve made, we still have a lot to do. Whats left on our list? Till up the grass, create and edge garden bed by the ivy, top dress lawn, and seed with clover and grass. 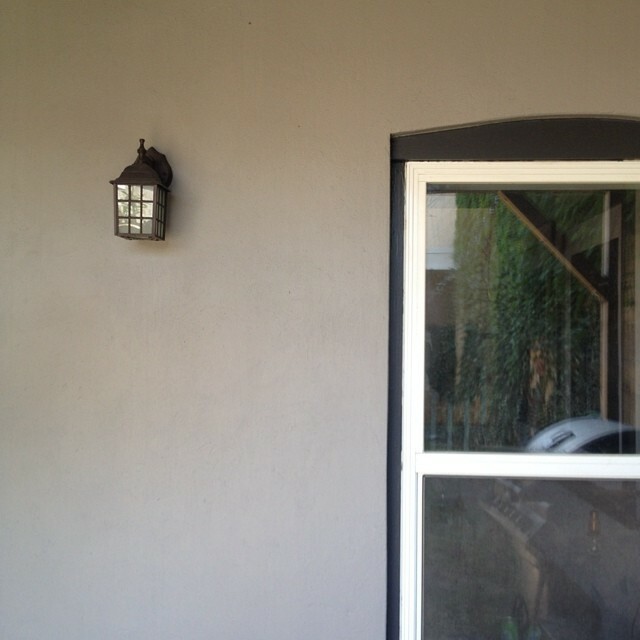 Get & install new exterior lights. I have my eye on these. Get fabric, and sew new outdoor drapes. Sew cover for outdoor daybed. Make 2 new outdoor side tables. Add some more flowers & landscaping. ANNNNNND we found another project to add to the list. 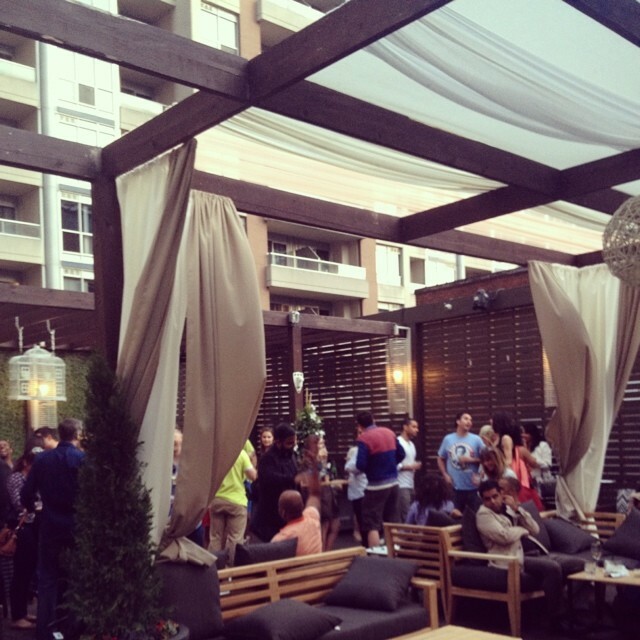 A few weeks ago we were out at a rooftop patio downtown, and they had this draped pergola shade structure. How perfect would that be on our upstairs deck? Yep! Add another project to the list. So what did you get up to on the weekend? Any backyard projects? That draped pergola is stunning!!! Def. something I need to keep in mind for our future outdoor project at the forever home. Isn't it great? The moment I saw it, I knew we had to have one! Surprisingly El Granto agreed 100% with me!